In mountain regions, infrastructure falicities and settlements are commonly to rockfall hazards. 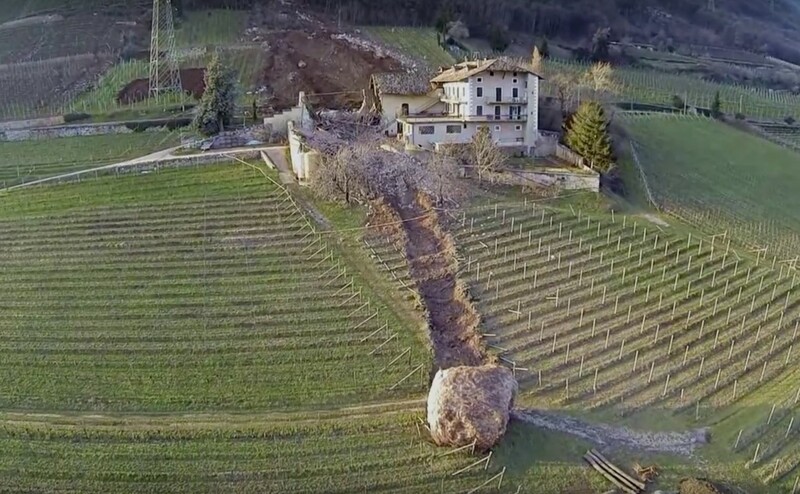 Transportation infrastructure, such as roads or railways, often has to pass through potentially hazardous mountain areas where it is possible to rockfall. Rockfall is defined as a free falling rock which is detached from rock mass and is moving downwards while energy and velocity of it increasing by time. Rockfalls are usually generally initiated by climatic or biological event, but also it can be initiated by seismic activity such as earthquake or blasting influence. Trajectories, impact energy and height of bouncing are depending on slope geometry, slope surface qualities and rockfall block characteristics (weight , shape of blocks, etc.). Rockfall as a term is first time mentonied and came into importance with railway construction in the mid 1830s. 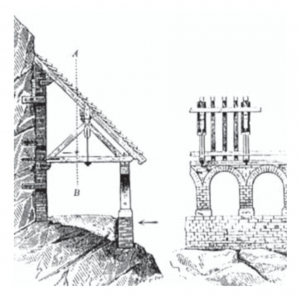 In 1950s, rockfall mitigation systems were consist of mainly rigid walls constructed from steel rails, wooden beams, earth walls tires etc. Rockfall barriers are used as flexible structures that allow system deformation for stopping block with impact energy – by increasing deformation the energy system is gradually dissipated through the braking systems. In order to present a system for the function of a curtain barrier, it is best to imagine the following: Imagine throwing a tennis ball in the curtain. What will happen? 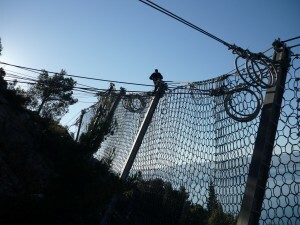 Rockfall barriers today represent only one of the protection systems, and their application depends on the impact energy, so we are still using today: fences, galleries and retention dams shown in photo 2. 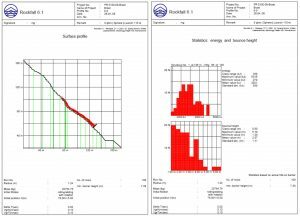 In order to evaluate the risk of rockfall and determine the type of rockfall barrier, it is necessary to execute a specific calculation and rockfall simulation. 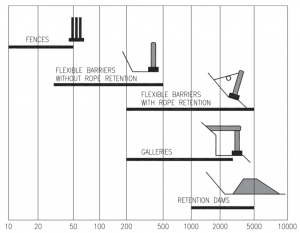 The deciding factors in the rockfall design of passive protection measures (rockfall barriers) are bouncing height and block energy impact. 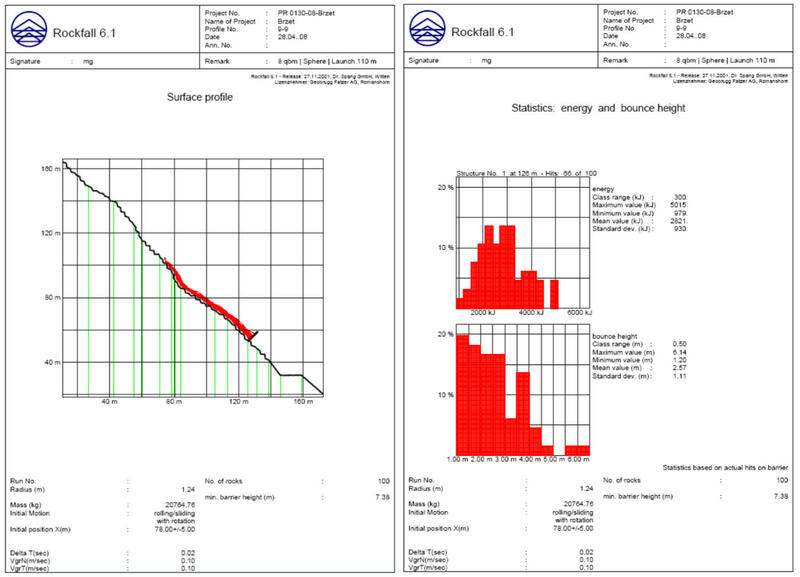 These two factors are determined by the analysis of the rockfall simulation analysis. Rockfall simulation is performed on several characteristic cross sections, depending on the slope and substrate geometry, through specialized computer programs. The programs enebles simulation of rockfall trajectory, boucing heigh and energy impact, all based on the predefined cross section. An example of the analysis is shown in the photo below. One of the key input parameters for analysis execution is the size and shape of the block that is used for simulations because it is most dependent on the result of the analysis. 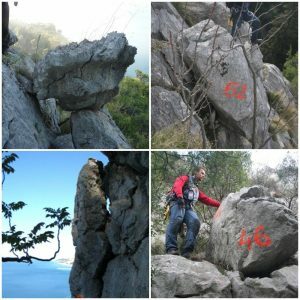 In order to determine the dimensions and shape of the block, it is necessary to execute detailed engineering geological mapping with an alpinist geologists. However, we have to be aware that rockfalls are natural phenomenon and can not be accurately calculated and predicted, so simulations are only approximate to real values and can not be taken into account with 100% confidence. The rockfall barriers represents an interesting topic in field of rock mass mechanics o we have to dedicate to them more attention in the future. Also, we will dedicate attention to projects that are already executed and common Croatia but nothing less challenging in the engineering sense: Omiš, Raspadalica, Brzet, Katarina, barriers along the highway, etc.